World banknotes collecting is a most exciting collecting field & alternative investment. Obverse: Design with portrait orientation. 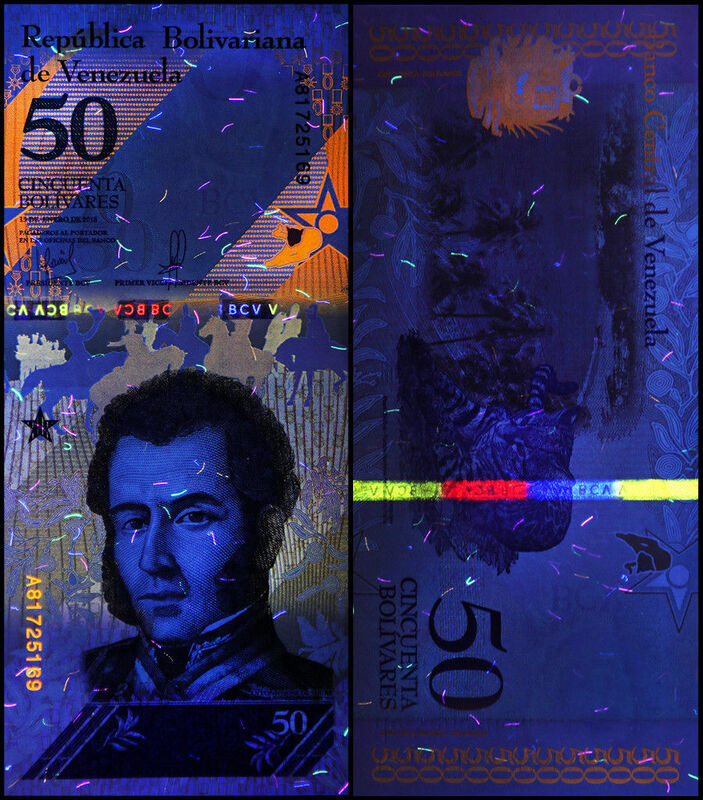 On the bottom, Antonio José de Sucre with the denomination value "50" below. The serial numbers are located at upper right and bottom left rotated 90 degrees clock-wise. On the top, "REPÚBLICA BOLIVARIANA DE VENEZUELA" «Bolivarian Republic of Venezuela». Below, the denomination value "50", the denomination in words "CINCUENTA BOLÍVARES" «Fifty Bolívares», the date, the payment clause "PAGADEROS AL PORTADOR EN LAS OFICINAS DEL BANCO" «Payments to the Bearier in the Offices of the Bank» and the signers. At right, watermarks zone. Reverse: Design with landscape orientation. In the center, over the field "Cunaguaro" Oncilla (Leopardus tigrinus) with Medina beach, Península de Paria National Park as background. On the right, watermarks zone. On the top left, the issuer name "BANCO CENTRAL DE VENEZUELA" «Central Bank of Venezuela». On the left, Coat of arms of Venezuela. On the bottom right, the denomination value "50" and the denomination in words "CINCUENTA BOLÍVARES" «Fifty Bolívares». Watermark: "BCV" and portrait of Simon Bolivar by Philippe Froesch. Size: 156 x 69 mm. General: Multicolor design with pink, violet and brown as predominant colors. Some security elements: Diving holographic security thread in 3 windows with "BCV", "BCV", "BCV" and "BCV" (in front of light); watermarks, invisible ink (ultraviolet) and see-through perfect print registration (Ocelot Leopardus pardalis and the star). On the obverse latent image "BCV" on the bottom.